Wednesday, March 21, is World Down Syndrome Day, and a Grove City family is asking others to celebrate everyone with intellectual disabilities. “They all have passions and they all have strengths. Look past the diagnosis,” Amanda MacIsaac said on Monday afternoon as she worked on a craft project with her kids at home. 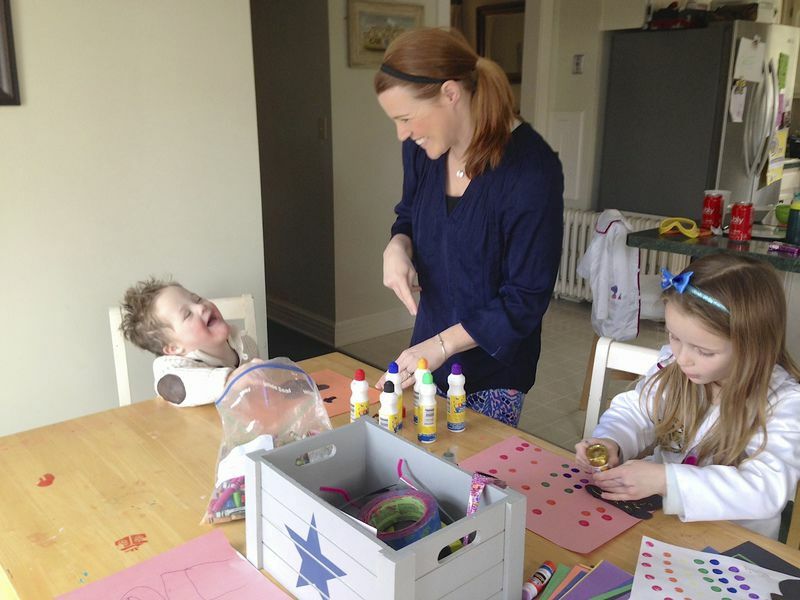 MacIsaac and her husband of 12 years, Matt, both Maine natives who also lived in Washington, DC, have two children: Dylan is 5 and is in pre-kindergarten, and Andrew, known as “Drew,” is 3, and he’s in preschool. Drew has Down syndrome, which MacIsaac said is the most common chromosomal condition, and it happens at conception. It is also known as “trisomy 21,” a genetic condition caused by an extra chromosome. To honor Drew and others with disabilities, MacIsaac is joining the National Down Syndrome Society in the Run for 3.21. She will be part of a team taking turns running about 260 miles from Washington, DC, to the United Nations in New York City. She has been collecting donations for the race – which will benefit many families – and she and her husband work hard to raise awareness for Down syndrome and other conditions, especially since they are coaches for the Special Olympics. The family has recognized World Down Syndrome Day since Drew was born, and while MacIsaac will be hitting the road this year without them, she is excited to part of such a large effort. Her goal is to raise $2,500 by the end of March, and she has just over $2,200 so far. She will be leaving DC on Monday, and her teammates will run in pairs, with the rest of the group following along in a van. MacIsaac enjoys running, and has been keeping up her endurance with a treadmill at home. “There’s no stopping to sleep,” she said, adding that she’s also running the Scope It Out 5K in DC on Sunday for a friend who has colon cancer. She looks forward to connecting with other families who have loved ones with Down syndrome, and supporting those who are new to the diagnosis. 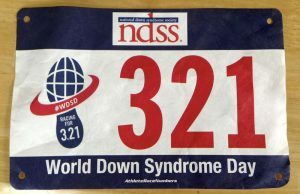 MacIsaac suggests everyone take part in World Down Syndrome Day by running or walking for 3.21 miles. 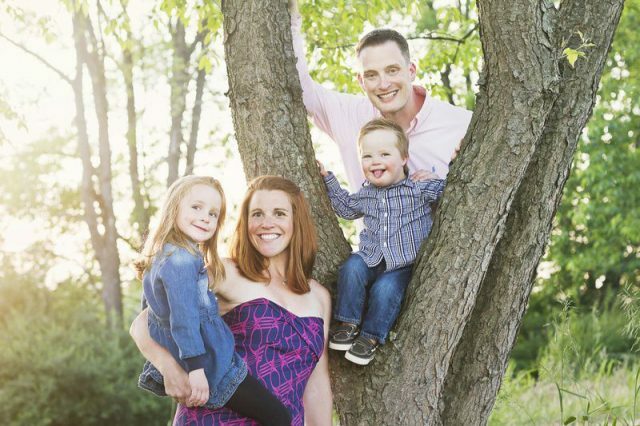 Last year, her family organized a walk at Hunter Farm Park in Grove City, and Matt MacIsaac is expected to be there sometime on Wednesday with Drew and Dylan. “We encourage people to go out and be active on that day,” she said. In the meantime, she is keeping busy with her family and Drew’s therapies – music, occupational, physical, horseback riding, speech and more. While Drew might seem different to some, his mom knows he’s pretty much a typical toddler. “Most of the things he does, a 3-year-old does,” she said as the kids painted rainbows on construction paper. Drew is not as verbal as other 3-year-olds, and he knows more than 100 sign language symbols. “He mostly communicates with signs and gestures,” MacIsaac said while Drew pointed out which color paint he wanted to use next. Drew was born early via emergency c-section at 33 weeks, and Matt MacIsaac told his wife that he thought their son had Down syndrome. “I didn’t even see him actually,” she said of the moments immediately following his birth. Drew was diagnosed a week after he was born, and he had excess fluid around his heart, lungs and kidneys, and in the amniotic sac. He spent about six weeks in the neonatal intensive care unit, and MacIsaac notes that she did not have testing done during pregnancy that checks for conditions like Down syndrome. Those tests are typically done on women 35 and older, or when there are suspected complications. “To us, it wouldn’t have mattered either way,” she said of how they would have felt knowing his diagnosis in advance. MacIsaac had been working as a design build manager at the time, and she decided to stay home with the children. The family had been living in DC, and they moved to Grove City in 2016 for Matt MacIsaac’s job with the U.S. Office of Personnel Management in Boyers. It is overwhelming at first when trying to learn about a new diagnosis and line up resources, but the MacIsaac family has had a lot of support from relatives, friends, the Down Syndrome Association of Northern Virginia, and healthcare providers like Dr. Bethany Skelton, who has since returned to medical school to learn more about helping people with Down syndrome. The family was a little nervous moving to a new community, but they’re loving Grove City, and Drew fits right in. They’ve made friends with the Lindh family; Eric and Polly have a daughter with Down syndrome, Marley, and MacIsaac has connected with other parents via Facebook. The family belongs to the Church of the Beloved Disciple, and they love spending time outside, and MacIsaac is manager of the Grove City Olde Town Farm Market. “And Dylan is the best big sister,” she said. Dylan helps Drew, engages him in activities, and always makes sure he’s included, often alongside Thatcher, the family’s Boston terrier, who is deaf. Drew loves music and got a drum set for Christmas, and he’s done well with music therapy at Slippery Rock University. There have been some challenges, like medical costs that are not covered by insurance, and the fact that people with Down syndrome are at a higher risk for respiratory conditions. Drew recently had surgery to remove his tonsils and adenoids – he had sleep apnea and multiple bouts of pneumonia and bronchitis and – and he has regular tests for hearing and vision. All of his doctors are in Wexford, so they do not have to travel too far, but it is difficult to explain medical procedures to a toddler who can’t verbalize what might be bothering him. “But a lot of time it’s the mother’s instinct,” MacIsaac said of knowing when something is wrong. There is some trial and error involved, like cutting out dairy and gluten to see if that will help with Drew’s skin irritation. And the MacIsaacs are always thinking about how they’ll have to adjust things as Drew gets older, like putting him in all-day kindergarten. “You always have to be constantly thinking a few steps ahead,” she said. MacIsaac is excited to spread the word about Down syndrome and continue to be an advocate, and she hopes others will share their experiences and take the time to educate themselves about intellectual disabilities. “Always assume competence and go from there,” she said of not focusing on the diagnosis. For more information about the National Down Syndrome Society, please visit here. To donate to Amanda MacIsaac’s fundraiser for the Run for 3.21, please visit here.